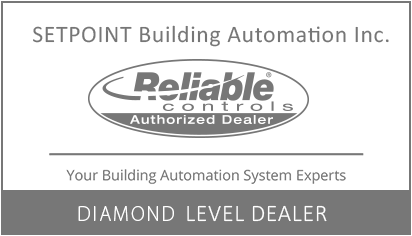 Setpoint Building Automation Inc. believes that a properly installed Building Automation System starts with an excellent design and installation, backed by accurate programming, commissioning and above all, superior service and support. Our Setpoint Team strives to exceed your expectations and are committed to earning your business. We service and install Reliable Controls Building Automation Systems (BAS) in Greater Toronto Area, Niagara, Hamilton, Barrie, Caledon, Collingwood, Muskoka, Peterborough, Oshawa, Durham region, and York regions. CONTACT US to have your building outfitted with a complete Energy Management Control Solution, helping your goals to maximize comfort, while reducing consumption of electricity, water and natural gas. All Reliable Controls products we install are BACnet Certified by an independant authority called the BACnet Testing Lab.